The bottom left of the map touches Israel. Lebanon is to the east, Turkey to the north, and Jordan below the long slant at the bottom. While many people in the world are upset at the to-date triumphs of the Islamic State, Israel is not. Here, by Israel, I mean the typically ultra-orthodox, nationalist Jews who have controlled the government for some time now. There are still many Jews in Israel that believe in human rights for all peoples, they just have been marginalized over time. The Islamic State fits perfectly into the National Zionist Zeitgeist Ideology (NZZI) narrative. Zionists like to pretend that Palestine was empty, more or less, before they arrived. The existence of large numbers of Palestinian survivors of the Holocaust of 1948 has always been an embarrassment. Extremist Zionists have always advocated a Greater Israel with various boundaries, but typically including everything south of Turkey and north of Mecca, to be taken in bites, of course. The Islamic State appears to Americans and Europeans to have no redeeming qualities. ISIS are ultra-orthodox Islamists hell bent on taking over the world and willing to kill anyone who disagrees with them, even other Sunni Islamic sects. Unlike the Palestinians, who traditionally were either moderates or secular, and the PLO, which was Marxist and therefore atheist, the Islamic State has no appeal to anyone outside its own camp. The Islamic State is the Israeli caricature of Palestinians, Arabs and Islam made into reality. So if the Islamic State takes over Syria, the Israelis can dust off the old war plans for the capture of Damascus. No one would stop their fighting ISIS, and the people of Damascus might actually welcome them. At first. 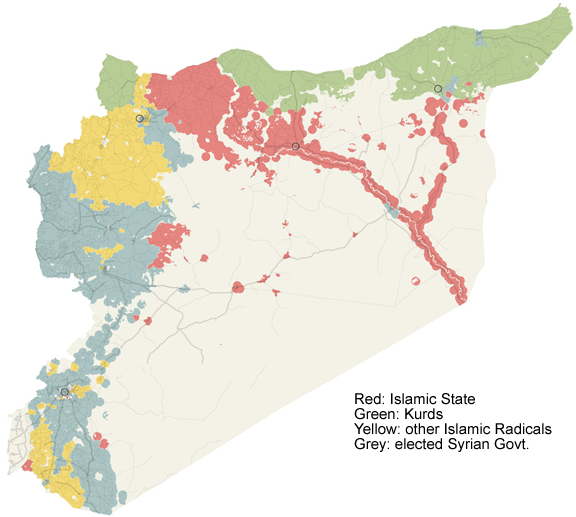 If the Islamic State takes Syria it will also take Lebanon and Jordan. Then Greater Israel is just a matter of eating, digesting, and eating again. Enough area can be left to the Islamic State to make it a permanent global threat that justified anything Israel does, including to the Palestinians within its borders. For the Israelis and Islamic State, it is a win-win situation. Of course, as Hitler learned when he tried to create Greater Germany, things don't always go according to plan.